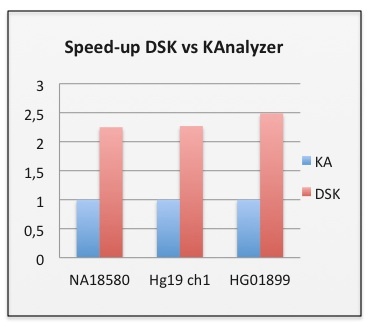 Results reported in the paper KAnalyze: A Fast Versatile Pipelined K-mer Toolkit in Bioinformatics about DSK don’t seem to fit the reality. Taking the same datasets, we run DSK and Kanalyze on our machines. The following table summarizes our experiments. Both softwares were run with 2 threads, 2 GB max of ram (default parameters for kanalyze), and k=31. For the HG01899 dataset, kanalyze used 352 GB of disk space to store its temporary files, while DSK required only a maximum of 75 GB of temp space. In the KAnalyze paper, authors claim DSK kmers count did not agree with other software results. While in fact, DSK and Kanalyze outputs exactly the same results when running kanalyze with the -rcanonical option (equivalent of -C option in jellyfish, and default in dsk). In their KAnalzye paper, authors add to the dsk run time a ‘parse’ time to convert the dsk result file (stored in binary) to a human-readable ASCII format. While dsk 1.5280 indeed included a python script to perform such conversion, an ascii result file is only needed for manual inspection or debugging. Real world usage of DSK inside an assembler or an aligner will work directly on the binary results file, which is much more compact and more efficient to read. Therefore a ‘parse’ conversion time has no reason to be included in total runtime. Furthermore, since October 2013, DSK releases include an efficient parser program written in C++.